NETWORK UPDATE: SUNDAY NIGHT FOOTBALL adjusted to 5.8, down 0.3 from last week’s game. Elsewhere, the only other adjustment was a 0.1 drop for the rerun of THE SIMPSONS. CABLE HIGHLIGHTS: Bravo’s REAL HOUSEWIVES OF ATLANTA dominated Sunday cable at 1.43, up 0.07 from last week, with a special lead-out VANDERPUMP RULES at 0.73 and WORK OUT NY down 0.02 to 0.23. TLC’s JILL & JESSA was up 0.13 to 0.82, and MARRIED BY MOM & DAD climbed 0.11 to 0.37; the night started with JILL & JESSA RECOUNT at 0.31. The season finale of TNT’s THE LIBRARIANS rose 0.07 to 0.55; it was followed by the 2-hour series finale of AGENT X at 0.26/0.21, slightly higher and lower than last week’s single hour at 0.24. History’s AX MEN gained 0.08 to 0.44. On Food Network, CUTTHROAT KITCHEN shed 0.04 to 0.42, GUY’S GROCERY GAMES was steady at 0.40, and CUPCAKE WARS KIDS was at 0.34. 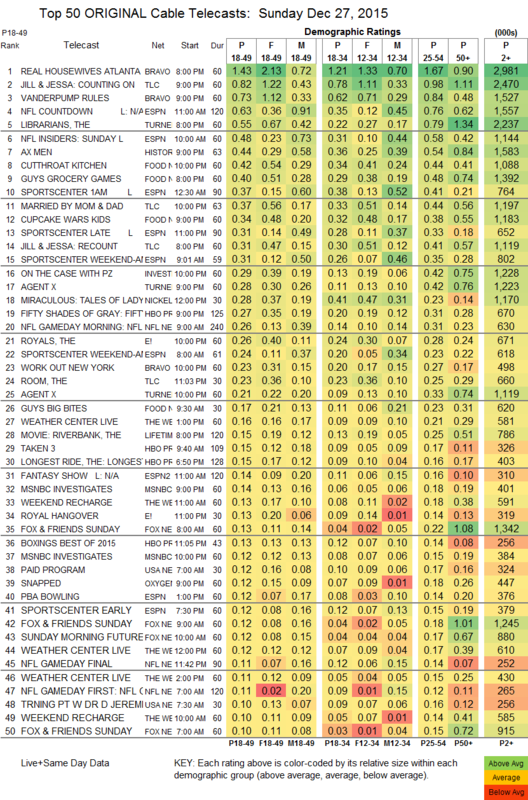 E!’s THE ROYALS, airing without a new KARDASHIANS lead-in, dropped 0.04 to 0.26. (On some systems, at least, a DVR set for ROYALS automatically taped its ROYAL HANGOVER lead-out special as well, although notwithstanding that assistance, HANGOVER was only at 0.11.) 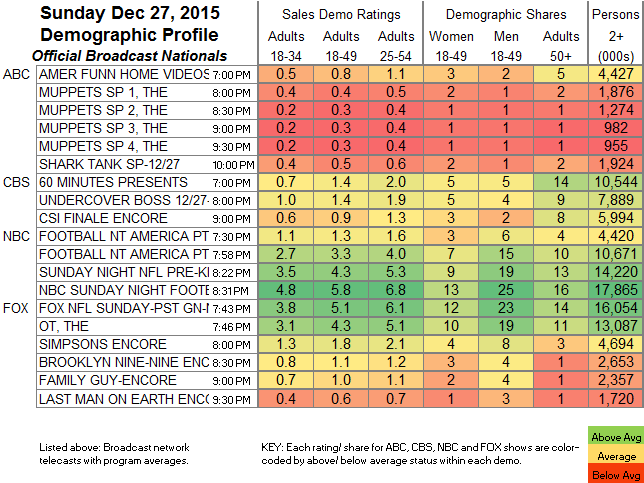 On Starz, the series finale of FLESH & BONE took a bad fall, down 0.04 to 0.02/93K.